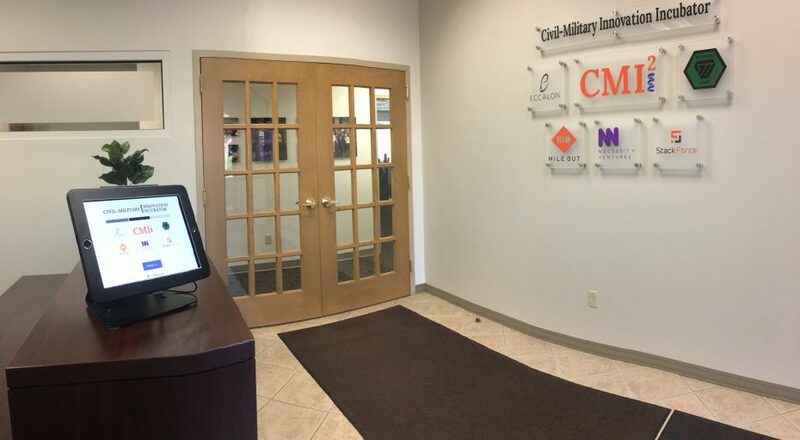 At the Civil-Military Innovation Institute, Inc., (CMI2) headquarters in West Virginia, several companies exist under one roof, all with a focus on supporting United States Department of Defense and developing dual-use (for government and commercial use) technologies. Each individual company is its own entity in separate offices, and when visitors step into the main reception area of the building, they enter a common lobby area. Beth Bossio is the Digital Content Manager for CMI2, and in early 2018, she implemented The Receptionist for iPad in the lobby of the CMI2 headquarters to make the check-in process more efficient and user-friendly. She recently spoke of her search for a visitor management system that was flexible and configurable enough to meet the unique nature of the CMI2 setup, and why she ultimately opted for The Receptionist for iPad. The Receptionist: Why did you started looking for a visitor management system? Had you been using a visitor management system? Beth Bossio: No, we had not used one before. Our building is set up with a lobby, and when someone enters, most offices don’t have a secretary to buzz someone in. We wanted something that greeted someone when they walked in, allowed them to sign in, and then notified us or someone at each company that a visitor had arrived. None of the business can see the front doors or know if someone is standing in the lobby, so we started looking for a system to help us. We wanted something that was easy to set up for us and that was user friendly for the person arriving. TR: How did you find The Receptionist? BB: I think when we first started Googling, we tried to look for multi-company, multi-tenant systems. I originally talked to the sales rep at The Receptionist, but it was a bit confusing at first trying to explain the multiple company setup. I originally thought The Receptionist wasn’t going to work, but once we got past the confusion of our setup, it turned out that The Receptionist actually worked very well for us and what we needed. I was able to add all of our companies to the software but still show visitors that we’re made up of several different companies. TR: What needs factored into your decision-making process? BB: We looked at several companies, and they didn’t give us all the controls that The Receptionist was able to do. With The Receptionist, we were able to easily add photos of the employees at each company, and also move our employees around in the system. The Receptionist gave us more control to customize the information we presented to each visitor. With the other systems we looked at, it was going to cost us way more and we still couldn’t do what we needed the software to do — we couldn’t change the universal landing page, and there were too many steps involved. TR: What made you choose The Receptionist for iPad? BB: I like that I can have all of our companies listed and the visitor can choose their unique path to check in. And we love the UPS and Fedex delivery notifications. It’s also been helpful for those of us who get locked out in the lobby and don’t have our keys. It’s a nice security system to ping someone to let us back in the office. I also liked that The Receptionist offered hardware that I could control and purchase. TR: What does The Receptionist for iPad allow you to do that you couldn’t before? BB: I just really like all of the control we get with The Receptionist. I like being able to easily add a photo of the employees at each company. People are more visual, and being able to see a person’s face makes it more personal instead of it just being a log in. I like that it wasn’t too expensive, and that for the cost, The Receptionist allowed me to have more control of every screen. We’ve had people come to visit and said, ‘Wow, we need something like this,” and I think software like this is becoming more common with incubators with common spaces like us.